It is seva that accelerates the sadhana of a seeker and lights the path to God. There is a saying that it is easy to be a saint on a mountaintop, but the real proof comes when you return to the marketplace. On the Siddha yoga path, we test our attainment and refine our understanding through the practice of seva, or selfless service. During the practice of seva, we perform familiar activities – whether cleaning, welcoming guests, working at the computer or leading music – with a focus on the Self, with awareness. As we work with others in a spiritual environment, we participate in a practical means of applying the Siddha Yoga teachings, creating a tangible offering of love in action. As we cultivate an attitude of service, we learn how to make all of our life’s work service to God; all aspects of our life become yoga. The Siddha Yoga Meditation Center in Philadelphia operates entirely through selfless service. We warmly invite you to participate in the practice of seva, which is not only one of the core practices of Siddha Yoga, it’s also a great way to meet people and take part in the community. Read a description of each seva opportunity below, then submit a seva form. Please let us know any special skills you have, or departments you might like to serve. ARATI: Arati is an act of worship during which a flame symbolizing the light of the Self is waved before the image of the Guru. This sacred practice is typically performed as an invocation to the Guru during the singing of a hymn. AMRIT: Satsangs and other events at the center are often accompanied by light refreshments or meals. Seva opportunities in Amrit include shopping, cooking, serving, and cleaning up. AUDIO VISUAL: AV sevites facilitate integrated audio, multimedia video and/or live-streaming during satsangs and other events. BOOKSTORE: Bookstore sevites assist people with purchases of books, music and meditation support tools for their spiritual journey. FLOWERS: Flower arrangements enhance the beauty of the sacred spaces in the meditation center. Flower sevites often arrive early to prepare, arrange and take flowers to pujas and tables, then stay after an event to distribute flowers to the community and to clean up. HALL: Hall sevites prepare the meditation hall for satsang. During satsang, they welcome and seat participants, manage the lighting and temperature in the hall, and ensure that the hall environment is supportive of spiritual experiences. HOSTING: Hosts facilitate satsangs from the podium, often reading texts, introducing chants, making announcements and leading participants through the various aspects of a satsang. This role requires training and ongoing coaching. HOUSEKEEPING: Housekeeping sevites ensure that the sacred and social spaces of the meditation center are maintained in pristine condition. This role involves cleaning, dusting, polishing and vacuuming on a periodic basis. MUSIC: Music sevites play instruments and lead chanting during satsang, preserving the sacred music of the Siddha Yoga Path. 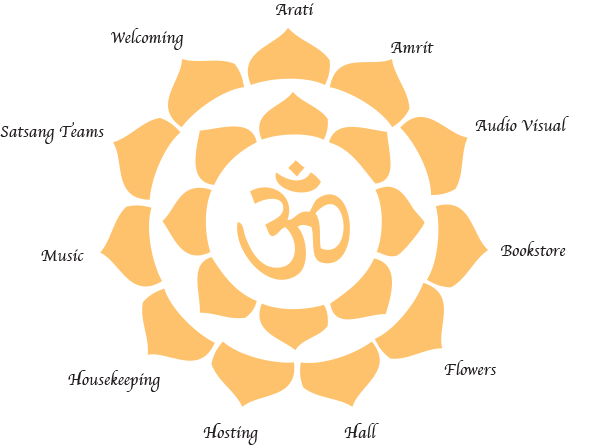 SATSANG TEAMS: There are currently four Satsang Teams who design, plan for and support weekly satsangs based on established Siddha Yoga guidelines. On the day of a satsang, the team hosts the satsang and provides supporting sevas including AV, Hall, Arati and Welcoming. WELCOMING: Welcoming sevites greet each person warmly and ensure that new visitors are given helpful information. In this way, they help to maintain the center’s sacred environment.